I chose wealthy Affiliate, after looking online for ways to make money. I never knew how powerful a platform like this could be, and now I have two businesses up and running with posts ranking on the first page of Google, and on page two and three of Bing and Yahoo. So far I have learned how to build a website, search targeted keywords, structure written content appropriately and more. Before I had become an affiliate marketer, I was not the best with computers but now, I’m cruising on my own at a very professional pace. I plan on growing my business to tremendous heights with the technology and teaching that my web hosting provides which is Wealthy Affiliate. I should also mention, I’m not just giving great feedback about them because I’m a member with them, I’m writing this testimonial because after being online now for nearly 12 months I still haven’t found anything that can perform the way they do. Well, I’m now 33 and a half, getting older, I know, but up until I’d say around 32 I had always done roof tiling laboring. I always wondered how long I could do roof tiling for because it was a really hard job, so as I got older, as I mentioned earlier, at around age 32 I began searching online for a way to supplement what I was earning and still make money. It did not take long before I found Wealthy Affiliate, that I pretty much straight away thought, this was something big. Now let me tell you why I immediately felt this way. As I was on the Starter membership (free version) I took a close examination of what was being said, about how you could form your own profitable online business, and start earning affiliate commissions. When Kyle, co founder, had began outlaying this business model it was making so much sense that I was 100% even more sure that if I stuck this out, I would be rich in the end. 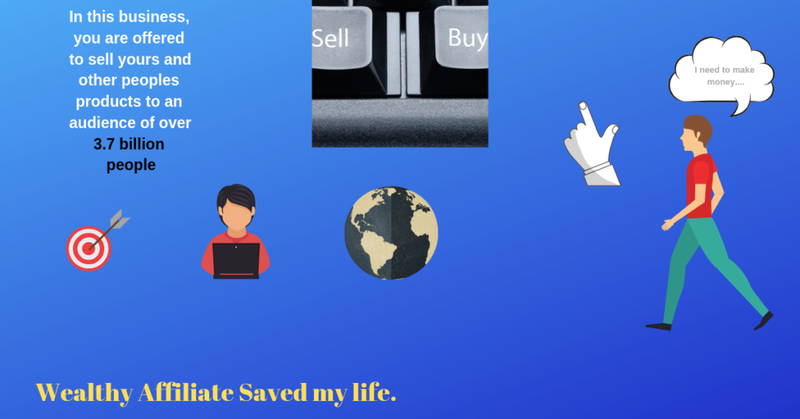 Because of this critical breakdown about how I could form an online affiliate business, and earn commissions by referring other people, I was led to pretty turn Premium straight away, which is what I did. Within the first week, I had upgraded and was going as fast as I could. The step by step technique that the training has to offer is like nothing else out there, which I have tried searching for. If people are wondering ‘does it work’ my answer is yes it does. Even if you don’t earn money straight away, you are still building something that will. Every blogger and affiliate marketer knows that the internet is run by quality content, and that’s another great aspect to this online business. What would you think if someone said you can promote somebody else’s product to a 4 billion person audience, and earn a share in commissions, and they will show you step by step how? Well, that is what this outstanding online business offers. After giving, you all that, I haven’t even mentioned the 1.4 million person online community which is live inside the Wealthy Affiliate platform. 1.4 million members are signed to Wealthy Affiliate and are always there to help you with any questions that you have. You can also directly write on Kyle’s wall (co founder) and he replies to every single post. Whatever questions you have you can ask the community and very quickly get a solution. Among all this are Live training classes and video teaching from leading world entrepreneurs, looking to teach the best. After learning what it was to be a premium member, and have all the benefits that premium has, I was convinced that I’m going somewhere successful. I now have access to private messaging within the community, over 300 hours of video training, live video training and more. I don’t want to talk something up for no reason, but with Wealthy Affiliate you can earn money by way of what’s called a passive income. This is revenue which comes in over time and after the work is done. I have started earning money, and can’t wait to earn more, also get my business on the world stage of affiliate marketing. This was my testimonial and hope you enjoyed it, thanks for reading! I would like to take this opportunity now, and, thank Babs Wagner for giving an opportunity to make this Wealthy Affiliate testimonial. She has been someone that I have gotten to know through the Wealthy Affiliate platform. We get along great, and I hope we see years and years out of this great relationship. « What is the Wealthy Affiliate Review about? Can I really make money? How nice! I also have the same unperturbed faith in wealthy affiliate. I’ve been here for about two months,and sincerely I’m still learning the ropes as I was an absolute newbie before signing up. I know it may take a while to make money off this program, but I also know I’m building a brand that can serve me for a lifetime. In one sentence, it’s worth the effort! This is a great informative and educative article especially for young ones. We don’t have to wait till we are old before making all the money we need. We can start our journey into the online business world through wealthy affiliate. Though it requires effort, time and seriousness to succeed with wealthy affiliate like any other online or offline business. I know this because I have been into this myself for some times now and I have not make millions but I see and believe the prospect! Good thing about wealthy affiliate is that you can do other things as it requires little time and capital! I started my online journey few years ago and I was able to make some small money until I found the “golden pot”; wealthy affiliate! Wealthy Affiliate has been absolutely awesome. I wish I can get everyone I know to join and become rich and financially free. I have never seen a platform that has so many ways to make people rich. And their free membership offer is such a blessing. You join for free and get enrolled in the online entrepreneurship certification training for free. I simply love Wealthy Affiliate! Cheers to our financial freedom! Thanks for your comment. I agree totally, Wealthy Affiliate is so good for making people rich and if you just stick to the training and stay persistent everyday, you’ll also have what the successful entrepreneurs have! Wealthy Affiliates to me as been a top–notch platform that has earned a very good reputation online in building online business giants. I am privileged to also be a premium member (though am just few months old) but i can say specifically that your review on Wealthy Affiliate is very honest and genuine. Thanks so much for this eye-opening review. I will surely bookmark your page and use as reference material in coaching newbies. Cheers!! Insightful article on wealthy affiliate platform. I never know how great and blessed is this platform until joined and it is great! As one of the best online money making site, WA is well structured and with what I read in this article, wealthy affiliate is a reliable and trustworthy site. I heard about this from friends and am now am a premium member. Thanks you for the right insightful review. The question now is can one earn for life with wealthy affiliate? . Wealthy Affiliate is a place you can learn almost anything about web you need to succeed online. The all-encompassing is the certification training therein the website. Getting to know how to build your website, keyword research and lots more, in just a few minutes. That is awesome. The WA community remains the cheapest place to get very high-value resources for your online business. My thrill is having access to build up to 50 websites for myself. Thank you for your kind review. Hi Michael, your testimonial on how WA has changed your life for better is great, and to be frank, others are also echoing the same testimony. Wealthy Affiliate is a life changer, it is a great platform that provides level playing ground for both newbies and gurus. Their training tools are top-notch, not to talk of the courses that walk one through on how to perform certain tasks. It doesn’t even take more than five minutes to creates one website. Their Affiliate commission is incomparable. It is truly a place to be. Congratulations on having made it thus far in WA. Thanks for this wonderful post, I also new to wealthy affiliate and I hope soon to start achieving my goals too of being a professional wealthy affiliate have the best training and they are always there to support you everyday. This is a really encouraging post, I can’t wait to start earning with the help of wealthy affiliate. I absolutely love what I read in this insightful article because it is full of great information. This is fascinating and interesting to me.Im also a newbie in affiliates marketing, I was skeptical about wealthy affiliate program in the first place but later took a bold steps join the program. This program is a life changer,weekly training and live chat are added advantage in this platform. Making use of wealthy affiliate as a medium to learn ways to build a successful online business which can lead to passive income is an idea a lot of people really miss. All they are interested in is getting into a platform meant to give them an instant profit. While that is all good they do miss the idea of what it means to build a passive income which is why some of them don’t succeed online. It is really good that you have started to earn because of the help of wealthy affiliate and I do hope your earnings increase on a regular basis.